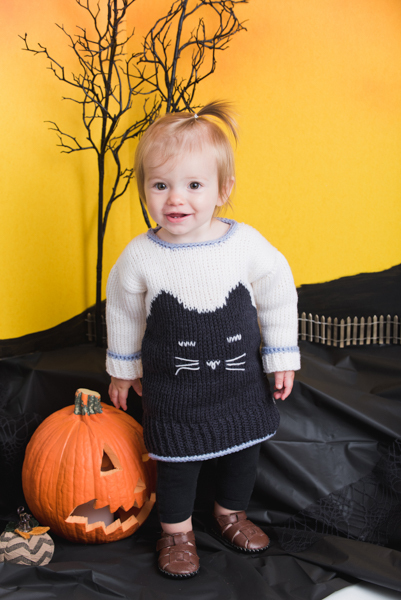 Kill ‘em with cuteness this Halloween. 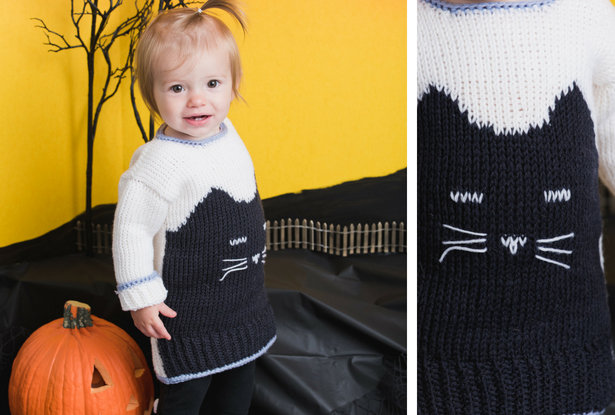 This cat sweater is crocheted mostly using the tunisian method, giving the appearance of knitted fabric. Make in the color scheme shown for a spooky, yet adorable black cat. Work Loops off Hook: Yo, pull through 1 lp on hook, (yo, pull through 2 lps on hook) across. Last lp on hook counts as first lp of next row. Tunisian Knit Stitch (TKS): Insert hook through work from front to back between strands of next vertical bar, yo, pull lp through. Pick-up Pass: (First lp on hk counts as a st) TKS to end of row. Return Pass: Work Loops off Hook. Rep Row 1 for patt. Each row of Tunisan Knit Stitch Pattern consists of two passes: a pick-up pass and a return pass. The right side is always facing. 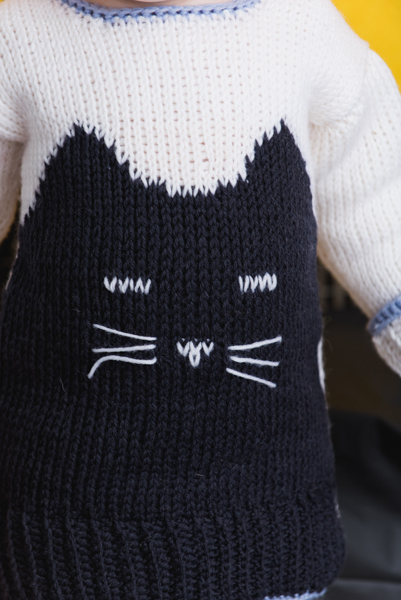 The cat motif on the front of the sweater is worked using the intarsia method. 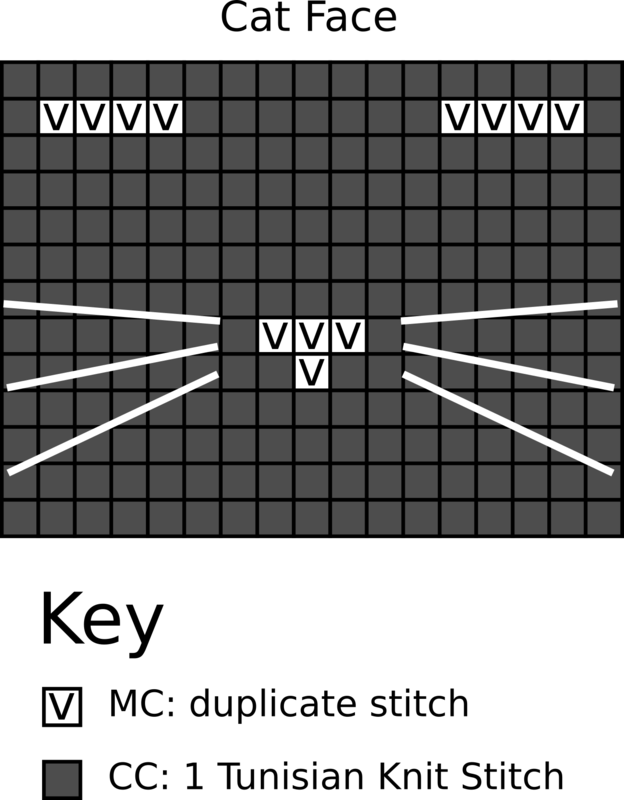 Each square on the chart counts as one row of Tunisian Knit Stitch Pattern / 2 passes. When switching to a new color, bring the new color up and around the old color to prevent holes from forming in the work. This sweater is worked in pieces and seamed. With MC and smaller hook, ch 13. Row 2 (WS): Ch 1, hdc in blo of each st across, turn. Row 3: Ch 1, sc in blo of each st across, turn. Rows 4-37 (41, 45, 51, 57, 63): Rep Rows 2-3. Do not turn at the end of the last row. Slide Tunisian hook through live loop. This counts as one st.
Work Return Pass of Tunisian Knit Stitch Pattern. Rows 2-48 (56, 66, 76, 86, 98): Cont in Tunisian Knit Stitch Pattern. Row 1 (RS): With CC2, work 37 (41, 45, 51, 57, 63) sc along lower edge, turn. Row 2 (WS): Ch 1, fphdc in each sc across. With CC1, work as for Back. Work as for Main Back through Row 24 (28, 32, 38, 44, 50). Work Rows 1-12 of Cat chart. 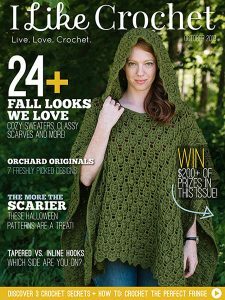 Each row of chart counts as 2 pass/1 row of Tunisian Knit Stitch Pattern. Cut CC1, continue in MC only. Work 4 (8, 12, 16, 20, 24) rows even in Tunisian Knit Stitch Pattern. Row 2: Work 1 row even in Tunisian Knit Stitch Pattern. 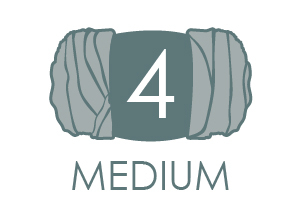 Skip center 9 (11, 11, 13, 15, 15) Neck sts, join yarn to next st.
Rep Rows 1-2, 3 (3, 4, 4, 4, 5) more times. (10 (11, 12, 14, 16, 18) sts rem for Shoulder). Rows 4-21 (23, 25, 27, 27, 29): Rep Rows 2-3. Do not turn at the end of the last row. 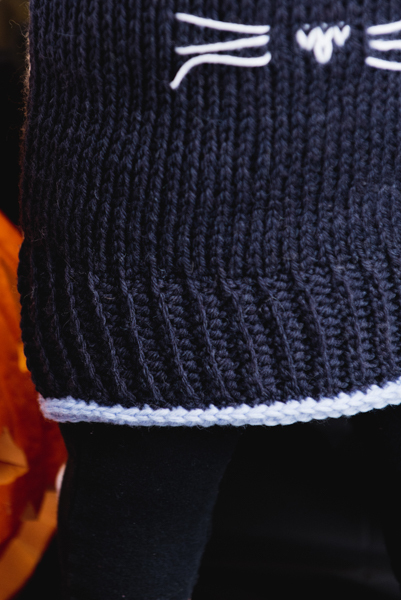 Work even in Tunisian Knit Stitch Pattern until Sleeve meas 6 (7, 8 ½, 10, 11 ½, 13)” from bottom edge of Cuff. Row 1 (RS): With CC2, work 21 (23, 25, 27, 27, 29) sc along lower edge, turn. Row 2 (WS): Ch 1, fphdc in each sc across. Fasten off. Block pieces to finished measurements. With MC, follow Cat Face chart for working duplicate stitches as noted. Center the chart across the black cat outline on the Front piece. For whiskers, use a single strand of line embroidery. Sew shoulder seams. Sew sleeve and side seams. Attach CC2 to Back Right neck with sl st.
Rnd 1 (RS): Ch 1, work sc evenly around neck opening, working 1 sc for each sc and each row, join with sl st to beg sc turn. Rnd 2 (WS): Ch 1, fphdc in each sc around, join with sl st to beg hdc. Weave in ends. Steam seams.